Well.. I've had many Keyboards and spent many hours searching for different items. Realforce 87UB Silent, Dark Grey Case, Variable 45g/35g, Krytox Lubed, Factory Silent Sliders, KbdFans 9009 Beige/White Keyset, MX Sliders in Esc/NumLock Row. Realforce 23UB, Dark Grey Case, Uniform 45g, Krytox Lubed, KbdFans 9009 Beige/White Keyset, MX Sliders in Top Row. HHKB Pro 2, HASU Controller, Dark Grey Case, Uniform 45g, Krytox Lubed, Dental Banded, HHKB White Blanks, KeyKollectiv Purple Mods. HHKB Pro 2 55G, Purple Silent Sliders + foam discs, Krytox Lubed, Realforce Keyset, HHKB blanks. HHKB Professional 1, Uniform 45G, Krytox Lubed, Dental Banded, Black Blank HHKB Keyset. 2003 NL Model (White with White Blank Keyset) Rev A0 (Green Mold Topre Proprietary Sensor Chip) Fully Restored. Retrobrited and Detailed Case. Denture Tabbed Sliders, Domes, Stabs, and Original White Blank Keyset. Removed and Detailed PCBs and Springs. Realforce 88UB, ISO, Black Case, Uniform 45g, Dental Banded, Lubed Stabs, Black Realforce 87UB Alphas, 88UB ISO Modifiers, Yellow ISO Modifiers, Mimic Orange USB Cable. Realforce 23UB, Dark Grey Case, Uniform 45g, Pexon USB Cable, White Printed Keyset. Realforce 23U, Uniform 45g, Black Printed Keyset. KBT KBC Poker X, ANSI, MX Clears, MX Grey in Spacebar, Lubed, Shelf Liner, Cherry Stabs, Costar Stabs in Spacebar, Beast Steel Plate (painted purple), KBT Pure Limited Aluminum Case, White LEDs on (Esc, WASD, Spacebar), IMSTO Cherry Irish Keyset. Board built by JDCarpe, Thank You! GON Happy, ISO, NerD 60 PCB, MX Vintage Clears, 62g Springs, Orange Stickers, Lubed, Purple Switch LEDs, Left Stemmed Caps Lock, 2 1x1 Backspace, Left ANSI Shift, Right Small Shift + 1x1 Fn, DCS Nostalgia Keyset. JD40, MX Blues with 62g Korean Gold springs, Clear Switch Tops, Costar Stabs in Spacebar, Dolch DSA keyset, Black Screws. GH60 rev. A, ISO, MX Vintage Clears, Left Stemmed Caps Lock, Right Small Shift + 1x1 Fn, IMSTO Steel Plate, Cherry G80 DS Sets ISO + ANSI. Board built by Codyeatworld, Thank You! 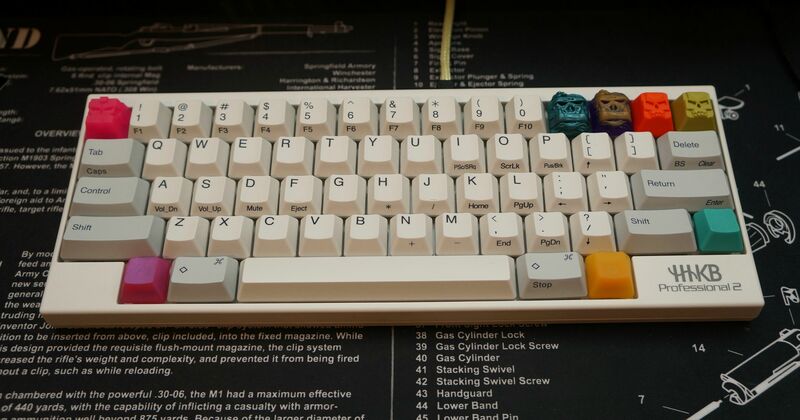 Leopold FC210TP, MX Clears, Lubed, GMK Charred Orange Keyset. IBM Space Saving Keyboard, Buckling Spring, 1987 Model. Black Plate, Bolt Modded, Laminated Label, Green LEDs on Caps / Num Locks, Floss Modded. Ducky MINI, ISO, MX Reds, Lubed, Shelf Liner, Cherry Stabs, Costar Stabs in Spacebar, Poker 2 Steel Plate, KBT Pure Limited Aluminum Case, Purple LEDs, Cherry G80 Keyset. ROCCAT Kone Pure Color, Orange. You should post all your awesome pics of your old stuff too. It would be nice to have them all in one place. Very nice collection mate, love that numpad. Y U NO LIKE HHKB? Beautiful shots as usual. That GH Nostlagia orange key sets looked delicious!! wow beautiful shots, i really like your poker x with Cyrillic Keyset. Yeah I could do that for you! Id post more of these shots but I just posted them in the Ducky and Korean threads so I better wait a bit hehe.. But I could post more of the old ones yeah. Thank You! JDcarpe helped me with that beauty!! haha.. I love that expresion, I use it all the time. I lovvve HHKB but only wanted 1 Topre board at this time. I may get another in the future. Thanks man! Yeah the Orange and Black is perfect. Love it! Hey, thanks for using your first post on me, thats awesome! Thanks, it is the Cherry Profile IMSTO set I believe. I know its Cherry profile but not 100% that its IMSTO. Thank You! I am going to add more photos as well as some previous boards. The plate for your Poker X looks to be purple. If that's the case, how did you get it that color? That would be my guess, but I'd like to know more. IIRC jdcarpe did that magic! This is correct! jdcarpe painted it! I love collection threads. Nice well rounded set. Obviously a 60% fan, I see. Thank you very much! Yes I am! There is a new board coming soon! Thank You very much! That would be a neat board. I have added more photos of each board! Also other boards. Love the climbing rope style USB connector you have on your HHKB. Did you make that yourself or is there somewhere I can get something similar? Thank You! That is from Pexon PCs! That is a great collection, and some lovely sets of caps. But you need a KC! Thank you very much! Yeah yours looks cool! What a fine collection you have there. Thank You very much! I love my Poker X.
Yeah I know you love it! It is an amazing custom by the one and only JD as you know. Thanks Bro! Photos updated, boards updated with all specs. 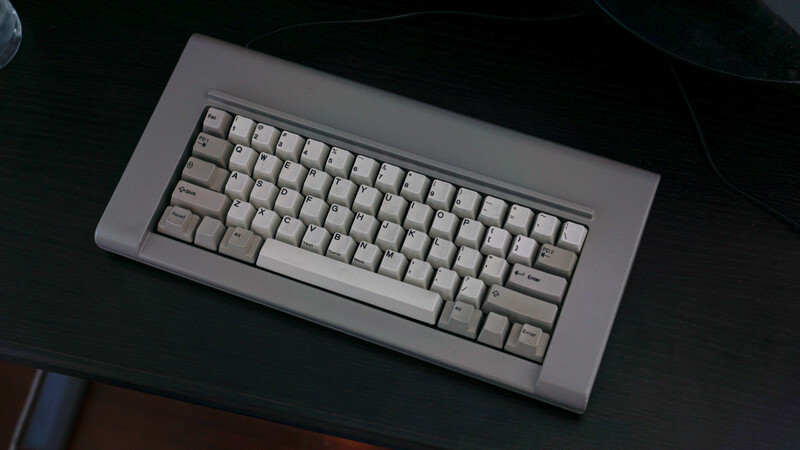 You have the classiest keyboards but WHY is your FC660C under "prior boards?" Uh oh, you caught me! I am back to MX. It has happened. I love the clicky feel of the MX switch. Thank You sir! So so envious. Classy collection. Would beg for any spare parts or advice. Sorry bro, but you can't just get rid of a 660C and expect to not get some flack for it. Sad to see that one leave your collection! derr.....where did the CC fn go then? Not afraid to ask the big questions. Thank You! 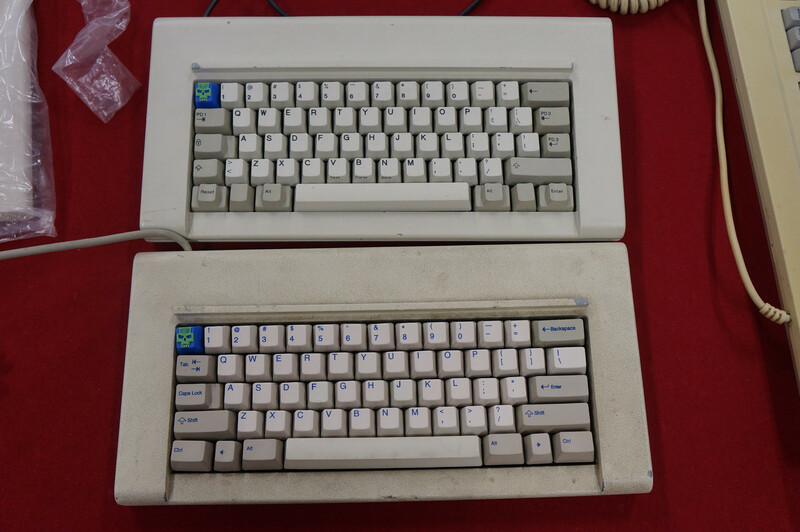 I have some spare topre modifiers and MX modifiers in my classifieds post. Yeah it is a great board! But still a tad too big. 60% is perfect for me. It went to a great fellow member, I'm sure you all will see it soon! Nice collection man. I would really like to know the difference between your poker and hhkb gotta be big thing. Thanks a lot THE DUDE! ! I loved both but didnt have money to keep both. I plan to get another HHKB someday soon but it may be a JP just to try something new. I chose to keep the Poker because of the low profile aluminum case, cherry pbt dyesub keycaps, leds, steel plate, control and windows keys, backspace key, caps lock key, keyset possibilities, clear switches w the tactile bump in them, and it just is funner to type on. The HHKB felt best I think with the lubed sliders and 55g domes. My fingers are getting weaker the older I get so I couldnt type on them any longer so the 45g lubed were my favorite for daily in the end. But I loved the HHKB for its 60% width size. So I do plan to get either a Pro 2 or a Pro JP eventually again but all the other factors make me love my Poker. SOON, VERY SOON I will be adding a new board to this page, I will post when I get it. Also I have a new keyset on my poker, will add photos of that when I take some nice photos. I share the pain on my FC660M. Why Leopold? Why? Those are some nice boards. Don't you have a tendency or desire to replace any of your boards to your most preferred switch ? I know it is kind of boring, but that is what I did. I mean, when there is something I love using I kind of find it hard using something else knowing that I could sell and replace it. Yep my favorite are clears and 45g and that is what is in all of the boards except for the Ducky Mini. That came with Reds, I had it lubed and left the Reds. Figured I could have one light switch board. Hell yea thanks dude, I love it! Added HHKB Pro 1, GON Happy ISO, and GH60 ISO. Also updated some photos and information. Photos coming soon of the others..
Nice collection Dustin! I begin to think collecting keyboards is cheaper than CC!